Cardinal and Garden par excellence! When I first started looking at Italian gardens, the monsters at Bomarzo were hidden in undergrowth and known only by word of mouth. They were difficult to find, neglected and lost in oblivion; visited only if you managed to find out where they were. The same could not be said for Villa Lante, which extends up the hillside above the agricultural village of Bagnaia. We found it neglected, with a few inappropriate geraniums tucked into pots. 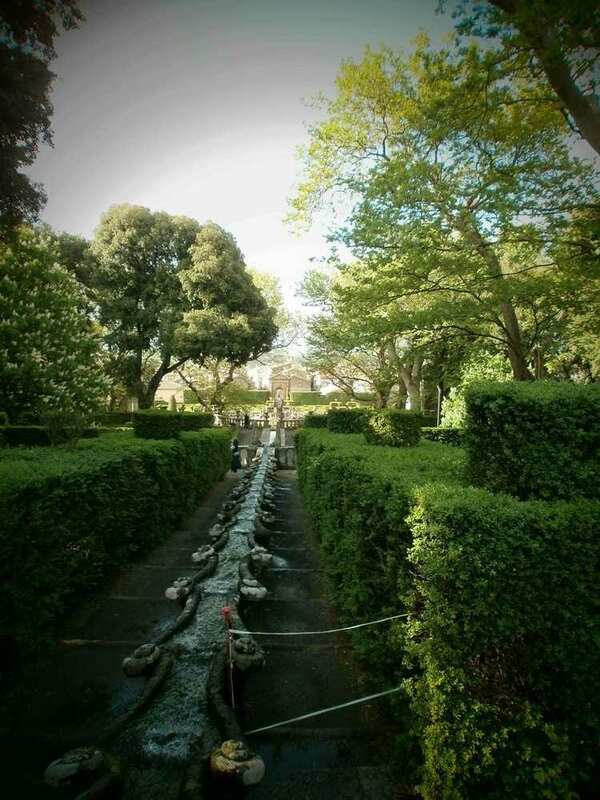 All that was before the explosion of interest in Italian gardens and their restoration, sometimes only just before undergrowth and woodland crushed the masonry and choked the fountains. Italian Mannerist gardens started in the early 1500s with the Medici villa at Castello that extended the walled and more formal Renaissance garden, full of intricate meaning for those who could recognise it,, into gardens of magnificence and grandeur, the precursors of Versailles and the Baroque garden.. 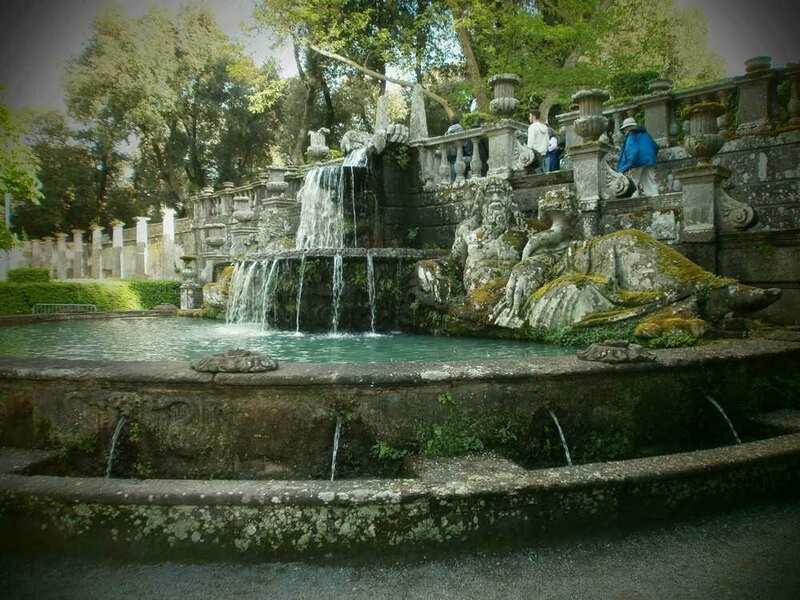 The sculpture and fountains could refer to classical themes, to gods, goddesses and nymphs with their associations carefully mingled in the minds of the educated visitors to reflect the erudition, culture and esteem of the person who had created their own paradise. When you have an axial road leading to the villa and gardens as at Caprarola, then the whole propagandist themes came, literally, into perspective. To lead to a pope in the family – or so it was hoped. Cardinal Gambara was related to the Farnese family and influenced by their villa at Caprarola. But his land was not as extensive, nor his purse, but his ambitions equalled theirs. You are supposed to wander up through the wilderness along meandering paths to the top of the hill above Bagnaia. There the water rushes out between two pavilions from springs on Monte Cimino and the magical descent begins. Following the water, down one moves to terraces to gaze down on the series of waterfalls over to the roofs of Bagnaia and on to the countryside accompanied by an orchestra of water sounds, over varying textures in stones and cobbles – beware of hidden water jokes that shoot up ladies’ skirts to the amusement of all – except one, perhaps! Shading us were all the evergreen pines and the holm oaks that grow wild in these parts, marred by some later planting of chestnut trees and even azaleas. 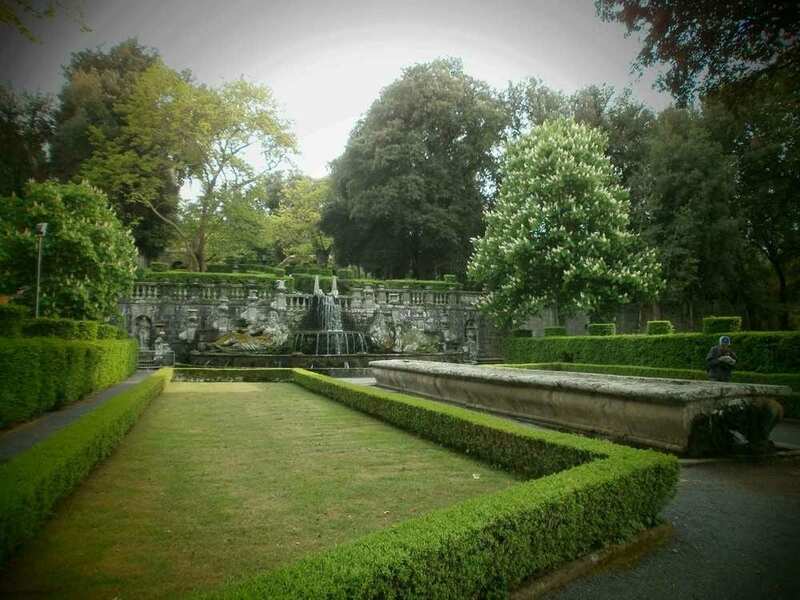 As at Villa d’Este and Caprarola, there were waterfalls descending along rills where you can dip your hand and run down steps with it in the water, but only here do we have the cardinal’s banqueting table. We paused by it, imagining all the servants with the benches, and all those bottles of wine cooling in the water that conveniently runs down the middle. These are gardens where architecture meets nature and plays with it, creating a garden from delineated by masonry in a harmony of shapes, textures and sound with water and sunlight on evergreen leaves of trees that already inhabit the hillside, summer and winter alike. 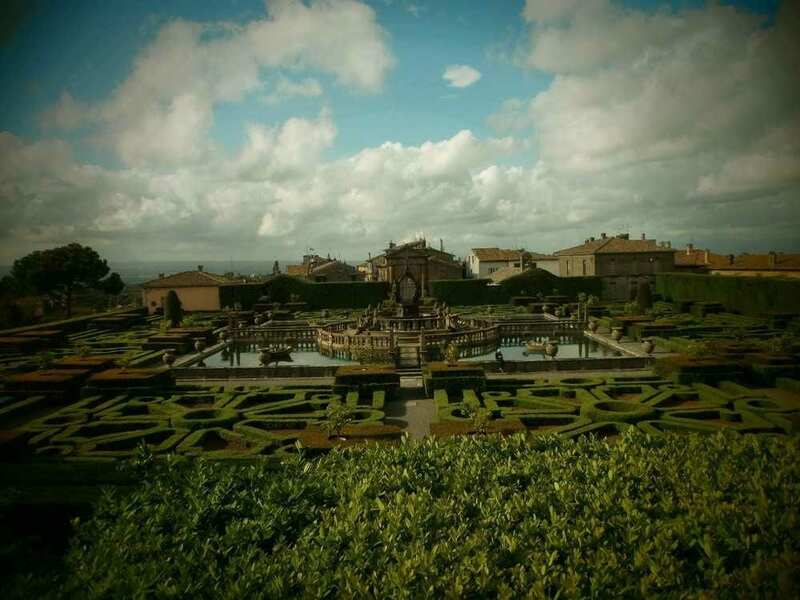 It culminates in a terrace right up against Bagnaia with a huge fountain in the middle of a geometrical box hedge garden – not a maze. Opinions differ whether the parts enclosed by box would have been planted – with what? Or whether they would have been covered in different coloured grit or pebbles. Perhaps it depended in the owner’s purse strings. Smaller, less diverse and spectacular than Villa d’Este, Cardinal Gambara played games with his name by having crayfish carved down the side of the water descending from one fountain to another. From the monsters in Bomarzo to the statues in Caprarola and Villa Lante, I wondered at the high quality of the generations of anonymous sculptors who were travelling from one garden to another, from Villa Giulia on the banks of the Tiber where the future Pope Julius III sunbathed in his secret garden (it’s now the main Etruscan Museum) to the gardens north of Rome. No names of sculptors, no brothers Taddeo and Federico Zuccari who also decorated the pavilions at Villa Lante and other known painters busily painting the frescoes. Now someone should look at the documents and find out who the sculptors and how they were paid.